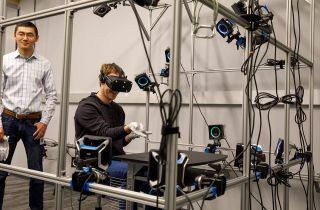 Facebook founder and CEO Mark Zuckerberg recently visited the Oculus Rift research facility in Redmond, Washington, and has shared some pictures of the upcoming VR innovations the company is working on. Most notably, it appears the next way we'll be controlling Oculus VR games is with a pair of gloves. "We're working on new ways to bring your hands in virtual and augmented reality," wrote Zuckerberg on his Facebook post. "Wearing these gloves, you can draw, type on a virtual keyboard, and even shoot webs like Spider Man. That's what I'm doing here." The picture shows Zuckerberg with an Oculus headset on, wearing gloves with a whole array of lights and sensors pointed at his hands. As pointed out by The Verge, these sensors are not the usual Oculus cameras, and instead look like some third-party OptiTrack sensors. Another thing to point out would be his reference to augmented reality, something Oculus does not currently support. There are already ways of controlling VR using gloves, such as the Manus VR which was unveiled last year. However this is the first time we've seen one of the major VR players branch out into glove technology rather than using physical controllers. Beyond the picture and the brief description, there's not much more information as of yet. We'll have to wait and see whether these gloves will be released in one form or another. We also imagine work is being done to scale back the amount of tracking you would need, to avoid consumers having to fork over cash for even more sensors like when the Oculus Touch launched last year.